Lovethesales.com is a fashion e-commerce aggregator that allows consumers to shop all sale items from multiple brands and retailers in a single online destination. It helps you find and compare every sale item, from 100s of retailers, to find the best prices on the brands and products you love. The website has over 500 brands and retailers. It features over 1,500,000 sale items on the site across all of its regions. 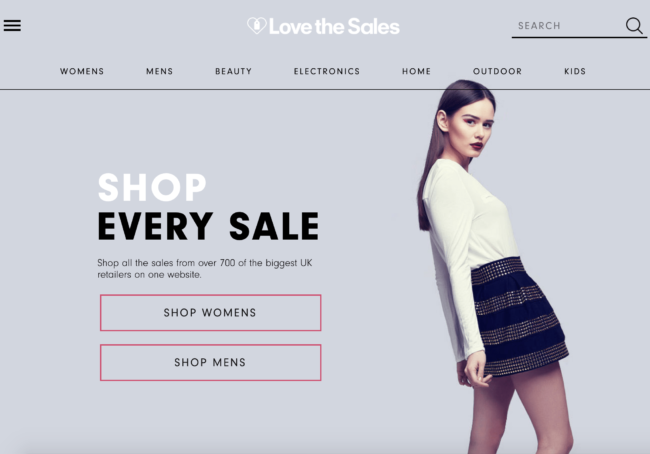 Lovethesales.com it’s a cool e-commerce site that aggregates all the sales from over 700 of the biggest UK retailers into a single online destination, enabling you to cross-shop from millions of fashion products. Go back to the Clothes and Accessories category to find more sites offering discounts, deals and offers on clothes and accessories.